Alex Kallenbach, 29, of Rockford, has Fragile X Syndrome and change makes him uncomfortable. However, since getting involved with Special Olympics in high school, “his ability to deal with change has improved steadily,” said his mother Angela Kallenbach. Angela’s story about how Special Olympics has affected her son was among the winners in Special Olympics Illinois’ Share Your Story contest. Read her winning story here. Alex tried soccer when he was 8 years old, but “it didn’t work out too well,” said his mother. “He was overloaded” by all the sensory stimulation, she said, and he withdrew from sports. “It’s helped him socially too,” said Angela, adding that he and his teammates have made friendships and do things outside of Special Olympics like going to movies or going go-karting together. Those changes in Alex have led to success for him on the job. He works through Goodwill Industries at the Federal Courthouse in Rockford doing light duty building maintenance – basically a mix of cleaning floors and windows, doing laundry and trash. “He’s not afraid to try something new. Without the skills he’s learned through Special Olympics, this would not be possible,” said Angela. Alex is such a fixture at work that co-workers come to watch his events. “He’s such a personality guy and he involves other people in his life,” his mother said. Special Olympics has also helped the family work together better, said Angela, adding her husband is teaching Alex to cook. 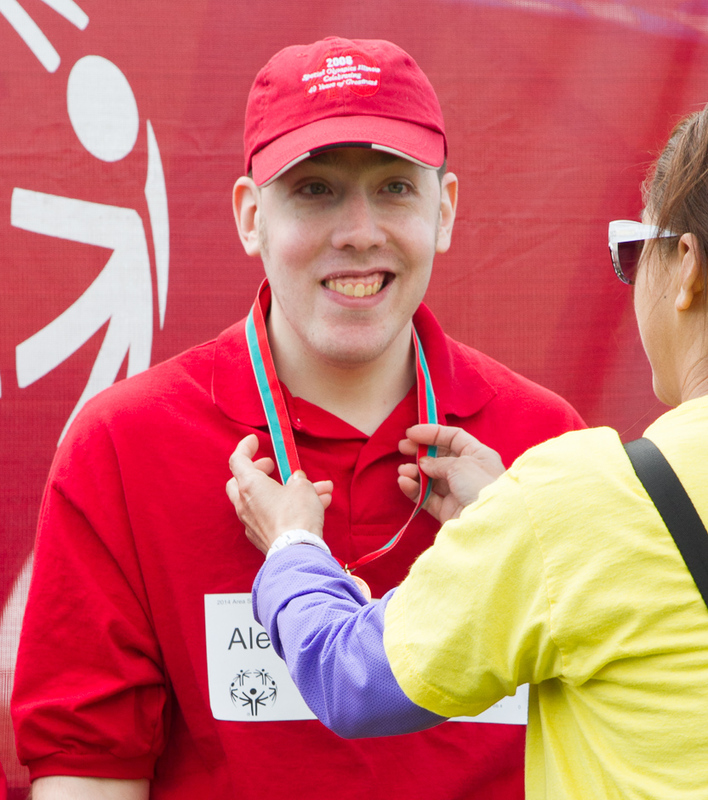 “We use Special Olympics as a teaching tool for Alex. ‘What did your coach say about this?’ and try to relate it to whatever we’re dealing with at home.” Both of Alex’s sisters are also very supportive of his Special Olympics efforts, coming to watch when possible and following on social media too.